US, 1998, 150 minutes, Colour. Bruce Willis, Billy Bob Thornton, Ben Affleck, Liv Tyler, Will Patton, Steve Buscemi, William Fickner, Owen Wilson, Michael Clarke Duncan, Peter Stormare, Jessica Steen, Keith David, Jason Isaacs. Armageddon is a pretty macho show. The screenplay was written by several male writers and it was directed by Michael Bay, who was responsible for such highly testosterone actioners, Bad Boys and The Rock, produced by Jerry Bruckheimer, whose CV includes the Beverley Hills Cop movies, Top Gun, Days of Thunder, Crimson Tide. It concentrates on the technical know-how required for confronting the asteroid and offers us, in great detail, the work done by NASA, the astronauts and the world-class drilling crew taken up to dig into the asteroid and plant a nuclear device. The central cast play the drilling team, the astronauts (with one woman), the Houston experts and the President and his advisers. Liv Tyler, as Bruce Willis's daughter who is more at home on a rig than in a domestic setting, is featured and does provide some emotion at the end, anxious about her father (a farewell by video sequence) and her fiance (Ben Affleck). The screenplay is in favour of the tradition of the roistering good ol' boys who never give up and don't know what failure means. Experts in their own fields, they don't think much of boffins (who think even less of them). You get the tone at once (or, after New York City is once again bombarded) as Bruce Willis drives golf balls from his rig in the South China Seas on to a boat with Greenpeace protesters. He then finds Affleck in bed with his daughter and chases him round the rig firing a gun at him. We know where we stand with him and his buddies. And then the President sends for him. The bulk of the film is also 'men's business', the mocking of psychological assessments, the training for going into space, the lift-off and the docking at a dilapidated Russian space station where a Russian good ol' boy shows and continues to show that experience rather than rote expertise is more effective. 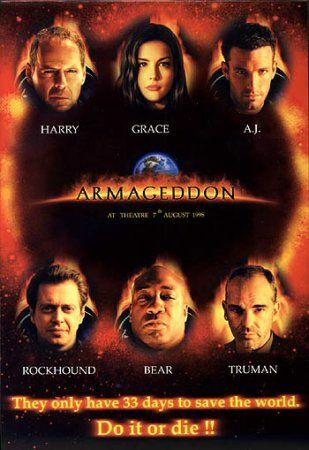 Armageddon is written for and marketed for a generally male audience who enjoy watching men's men doing what a man's gotta do and watching the technology and expertise used in doing it. 1.The popularity of the film? Box-office success? Audiences all around the world? A film of 1998? Meteors, the approach of the millennium? 2.The production values, the locations, the drilling, the training, the shuttles, space? The special effects? The impact of the drama and the effects? The song, the musical score? 3.The title, expectations, the biblical overtones, the end of the world? 4.The introduction, New York City, the meteor showers, the range of destruction? The response of Houston, NASA? The president, the politicians? The decisions about the confrontation – and how to handle the approach of the asteroid? 5.Bruce Willis as Harry, his reputation, on the derrick, his work, hard living, hard hitting? His relationship with Grace? Her fiancé? The chase, the shooting? The golf and the greenies? The macho attitudes? The different individuals in his team? 6.Recruiting, the crashing of the cars, the oil, the gamble, women? The background of family? The Stampers? A.J. Frost? 7.The antagonism, the orders of NASA, Harry and his declaration that there was no time, wanting to use his own team? The training, the difficulties, the exercises, the need for speed? 8.The mission, getting ready to go, Grace and the emotional impact, the farewell to A.J. Frost? 10.The various personalities of the team, the politicians, their interactions? Sharp as the shuttle Freedom pilot? Rockhound and his madness? Chick Chapple and his contribution? Oscar, the geologist? The Bear? Max Lennert? General Kimsey? Jennifer Watts, the co-pilot of the shuttle? Doctor Quincy and his research? 11.The president of NASA, Dan Truman, the decisions, the inadequacy of NASA, budget? The decision about the bomb? The technology needed, the impact of the bomb and the calculation of splitting the asteroid? The eighteen days? Harry and the disconnect from NASA? The pilots of the shuttle and their going on the mission? 12.Success, Harry and A.J. Frost, the final decisions, Harry talking to the television – giving his life? 13.Houston, the monitoring of the operation, the success, self-sacrifice, Harry missing the wedding? 14.Audience response to the success of the mission? The fear in an asteroid coming to Earth, the possible destruction? Human ingenuity, technology to avert disaster?